Put on your investigator's cap, and solve a series of unexplained deaths. 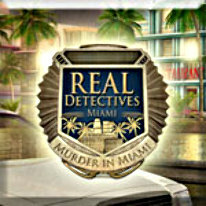 Solve a series of unexplained deaths in Real Detectives: Murder in Miami. Known as the "Magic City," Miami is a playground for the active and glamorous, but to the Real Detectives, it's just another town where the bright lights and trendy streets mask the mayhem of murder and deceit. Most recently, a rash of baffling and seemingly unconnected deaths has struck Miami. As rocks are overturned and questions asked, a tangled web is revealed. Tag along with detectives, Dan Foible and Katherine Healer, as they search for the answers to unravel it. Investigate crime scenes, collect evidence, and interrogate suspects. Follow the clues from location to location and use an assortment of tools to solve key puzzles. Can you fit all of the pieces together and ensure that justice is served?